﻿ Pine Cliffs Hotel, a Luxury Collection Resort, Algarve, Albufeira | FROM $208 - SAVE ON AGODA! "The hotel is maintained at very high standards, and the staf..."
Have a question for Pine Cliffs Hotel, a Luxury Collection Resort, Algarve? Designed for both business and leisure travel, Pine Cliffs Hotel a Luxury Collection Resort Algar is ideally situated in Olhos de Agua; one of the city's most popular locales. From here, guests can enjoy easy access to all that the lively city has to offer. No less exceptional is the hotel's easy access to the city's myriad attractions and landmarks, such as Cork World & Co., Praca de toiros de Albufeira, Montechoro Strip. 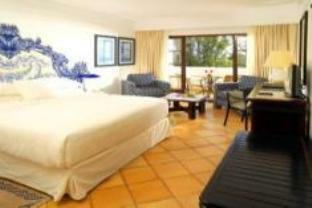 Take advantage of a wealth of unrivaled services and amenities at this Albufeira hotel. A selection of top-class facilities such as 24-hour front desk, facilities for disabled guests, luggage storage, car park, room service can be enjoyed at the hotel. Guests can choose from 215 rooms, all of which exude an atmosphere of total peace and harmony. Besides, the hotel's host of recreational offerings ensures you have plenty to do during your stay. Pine Cliffs Hotel a Luxury Collection Resort Algar is an ideal place of stay for travelers seeking charm, comfort and convenience in Albufeira. We have stayed twice at this hotel this year, and we tell our friends if they plan to visit the south of Portugal, they are making a mistake not staying at this hotel. The hotel is maintained at very high standards, and the staff is friendly with the location second to none.